Show a clear product matrix for configurable items to help customers quickly add multiple child products to cart. Choose specific items for which the matrix should be displayed and easily hide out of stock products. Enrich your color swatches functionality with an easy-to-use Product Matrix extension. Automatically generate a special matrix form which displays all available simple options of a configurable product. Thus, letting wholesalers add to cart multiple child products in one go. Hide out of stock items, display old prices and choose the products for which the matrix should be generated. The product matrix tool for Magento automatically creates a handy table based on the last product attribute. Due to the option, customers can instantly add multiple child products to cart in a couple of clicks. To show the matrix for a particular attribute simply change your attributes order by placing the necessary attribute last. With the Magento product matrix extension you can show a special table either for all or for specific products to effectively regulate the matrix display. To engage customers even more, you can display the amount of available inventory. Hurry up shoppers and let them knoe that the product is popular and much-in-demand. 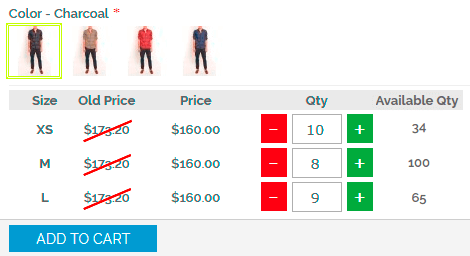 Remove all out of stock product configurations from the matrix to let visitors see only relevant information. This way you'll significantly improve customer shopping experience and raise their satisfaction. If you offer products with discounts and want to draw customers' attention to a bargain price, include old prices in the matrix to highlight the difference between old and discounted prices. The module perfectly works with the Color Swatches Pro extension and lets you exploit swatches functionality to the full.